The voordalak are a creature of legend, tales of which have terrified Russian children for generations. But for Captain Aleksei Ivanonvich Danilov—a child of more enlightened times—it is a legend that has long been forgotten. Besides, in the autumn of 1812, he faces a more tangible enemy—the Grande Armée of Napoleon Bonaparte. I have to admit from the beginning that my relationship with vampire stories was always with ups and downs and it always depends on many factors. 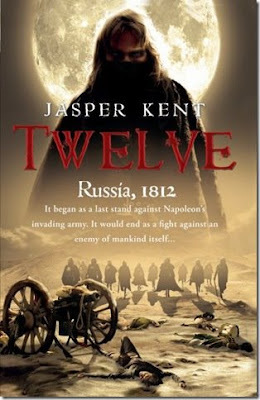 My initial encounter with the Jasper Kent’s debut novel, “Twelve”, was with its blend statement between historical fiction and supernatural aspects which made me more than curious. I will admit also from the beginning that I wasn’t disappointed at all. The main plot of the novel concentrates on the supernatural aspects and the interaction of the characters with these aspects, but it is gravitated by many other smaller or bigger aspects that enrich the story and made me enjoy it for each one of them. Jasper Kent excellently sets his vampire story into one of our historical tumultuous era, but the link between the supernatural aspect and the historical setting goes deeper than the initial premise, there is a parallel between these two that set me well on thoughts. “Twelve” is also a story about humanity, human emotions, patriotism and above all, about war. Jasper Kent pictures a country, Russia, and a city, Moscow, invaded by the Napoleon’s army with talent and details that can bring him only praise. The author also recreates with accuracy an overwhelming atmosphere of an invaded country and city and I could almost feel the fear and the insecurity of the citizens. I believe that because this atmosphere and care for details throughout the course of the story war becomes a character in itself. With ease two particular scenes jump to my memory, one involving a dragoon searching a place in the carts transporting the wounded for his friend and the scene of the French army crossing the Berezina River. And through such scenes I wondered in many places who will prove to be more inhuman, the vampires or the humans themselves. The main characters are four Russian officers with an espionage mission and the story is told from the perspective of one of these officers, Aleksei Ivanovich Danilov. Jasper Kent proves his talent too and makes from Aleksei Ivanovich an interesting character, building him not only through his present actions, but through his memories of war as well. I become attached to this character pretty quickly and I really liked to see all his emotions, to see how he is torn between loyalties, duties and feelings. And his unconventional love story with Domnikiia adds new layers to the complexity of his character. I could also feel that if he were not facing the twisted reality of war his actions might have been different. Jasper Kent creates with talent a wonderful novel, but “Twelve” is not entirely without flaws. The novel starts slowly, the author taking his time in introducing the reader to the setting and plot. Also, as the story draws to an end it is heading to an obvious conflict, compensated however by an interesting twist in the plot. There are moments that didn’t sounded right to me, for example an exhausted and wounded Aleksei Ivanovich spending a night in the Russian winter outside (I believe he would have freeze to death) or a scene where the same Aleksei is deceived, but I find it hard to achieve such an outcome with so little information. Fortunately, these flaws and moments are heavily overwhelmed by the good and strong aspects of the novel. It is hard for me to set “Twelve” in a particular category, because the novel is an original one and its characteristics and setting can satisfy the readers of different genres. But it is easy for me to say that Jasper Kent proves great talent and imagination and its debut is an excellent and powerful one. Sounds like an alternate history paranormal military fantasy to me. be interesting to see how he develops then, maybe he can fix some of these floors in the next book. I loved Twelve too and I am eager for the sequels; as for categorization it's historical fiction with a tinge of the fantastic; no alteration to historical events, so it's not alternate history or fantasy. Liviu, "Twelve" is a very good novel indeed. I love Dumas and Mika Waltari novels too. I hope you get Raven since it's a viking/saxon blood and guts page turner and the odds are that if you enjoyed Twelve a lot, you will enjoy that a lot. I'm also no that big vampire fan. But what I know so far (from reviews I read including yours) it is the combination of history and paranormal which makes it worth reading. Will get my copy in July 2009. Look forward to read it. Very nice review, Mihai, and this sounds like I would enjoy reading it. Liviu, I'll read "Raven" as soon as I get a copy. I have also "Gladiatrix" and I'll read that one as well and also I'll add "Vlad" to my buying list.